Often times, when clients approach us for help they are already getting traffic and making sales. They just want to scale. They want to go from $10k/month to $100k/month, for example, and use Facebook marketing to get there. How do we get them there? Well, for one, they are prepared to invest in Facebook Ads. They also don’t expect to get there in 30 days or even 60 days. They understand that the process of Facebook marketing takes time and testing. To build a truly great, revenue generating machine they understand that one must be patient and in it for the long term. I know, I know, I still haven’t answered the question of how we get them scaling. Well, we come in with a Facebook marketing strategy and a Facebook ad funnel. Two-thirds of that Facebook ad funnel is retargeting. I touch on retargeting in this blog post. Today I’d like to focus on the other one-third: Top of Funnel. What does Top of Funnel mean in Facebook marketing jargon? It’s the part of the Facebook ad funnel where we find new buyers and generate awareness of your brand and build interest in your products. A small portion of this audience will purchase but the vast majority of them will need to be retargeted. When we retarget them with Facebook ads we bring them further down the Facebook marketing funnel and through their buying journey. In other words, we generate intent and desire to take action and buy. In the agency, we like to use conversion campaigns, optimizing for purchases. We always test single image, carousel and video in terms of creative and craft copy that is compelling. In your copy, focus on your unique selling proposition, highlight why prospects should buy from your brand and add some social proof (think product reviews here). Now before I talk about how we increase ad spend at scale while maintaining ROI, I’d like to show you how to research targeting options for Facebook ads. So you will want to go to your Business Manager and then Audience Insights. There’s two main ways to do research for your Facebook marketing. You can research people who like your page and you can research general interests. Audience Insights gives you lots of information but I mostly like to focus on the demographics and page likes sections. Take a look at the two images below to familiarize yourself with the interface and then I will talk about affinity. So what does affinity mean for Facebook marketing and your Facebook ads? The affinity score is how likely the people we are researching are to like that page compared to the rest of Facebook. The higher the affinity, the better for your Facebook ads. If you have affinity scores over 1,000 you are definitely on the right track! So essentially you can use what you find out here (age, gender, page interests) to build your targeting for your Facebook ads. For national campaigns, I like an audience size of 500,000 to 2,000,0000 to start testing. Alright, so once you are seeing a positive return on your Top of Funnel ads and you are ready to start scaling (i.e., spending more money) - how do you do that? Well you can increase your daily budget 16-20% every 1-3 days. You can also duplicate ad sets and focus your targeting on the interests, age ranges or genders getting you the most return on investment. That’s a bit more advanced, though. To find out how we can help scale your business with Facebook marketing, schedule a time to chat with us here. Strategy sessions are free and a great way to do a deep dive into your business, identify areas for improvement and opportunities for growth with Facebook ads. As an online retailer, the struggle to turn web visitors into purchasers is real. Did you know that the industry average is 1-3% of people who visit your site will actually make a purchase on that first visit? You can use Facebook ads and Facebook marketing techniques to retarget the visitors who didn't purchase, giving them a reason to come back and buy. Similarly you can also retarget people who engaged with your Facebook or Instagram pages, giving them a call to action to visit the site. 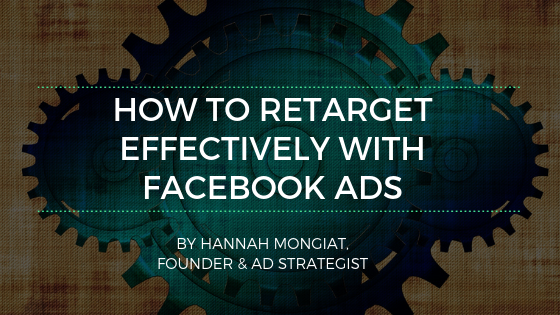 There are loads of way to retarget people with Facebook ads. Often times, when we start working with clients they are doing one small part of a full e-commerce purchasing funnel. That part is usually what we call the Top of Funnel, which is directing an ad to cold traffic with a call to action to visit the site and buy. Keep reading to find out three ways we retarget our clients' traffic with Facebook ads. By the end of this article you will have a little insider knowledge to Facebook marketing and be able to help recover lost sales from traffic you are already getting to your site with Facebook ads. You can retarget site visitors who didn’t purchase or add to cart by setting up custom audiences. Let’s learn how to do that! Go to Asset Library -> Audiences and click Create Audiences. Here is where you will create your custom audiences. You can create one for all web visitors in the last 14 or 30 days, for example. Then you will want to create seperate custom audiences for people who fired events. Here is where you can create audiences for people who added to cart or purchased. Then, when you set up your Facebook ad campaign, for your targeting you can select the custom audiences you created. In the image below we are targeting web visitors in the last 14 days but excluding purchasers in the last 30 days. You could also add an exclusion of people who add to cart, if you want. We want to exclude purchasers because if they have already made a purchase, you don’t want them seeing a Facebook ad asking them to visit the site again to make their purchase. You can absolutely retarget purchasers, asking them to buy again but that’s a different strategy discussed below. Another segment of people you can retarget with Facebook ads is people who engaged with your social media channels and content. We need to create custom audiences again. So, go to Business Manager and then go to Asset Library -> Audiences and click Create Audiences. This time we are going to choose Engagement. As an effective Facebook marketing strategy, I would recommend retargeting people who engaged with your Facebook Page, Instagram Business Profile and who viewed any videos you have. You could use all three of these audiences as your targeting for one Facebook ad. Do you remember how we learned how to create a custom audience of people who purchased early in this post? Well, you can target just them in an ad set! Why might you want to do that? There are a few different Facebook marketing strategies you could use. Facebook marketing is such a cool tool! Let’s take a look. Target purchasers in the last 3 days with simply a thank-you ad. Thank them for becoming part of the brand family, tell them you appreciate the business and remind them of any perks you have for repeat purchases (loyalty or rewards programs, for example). You could target people who made a purchase 30 days ago, giving them a coupon code to pass on to family and friends. You could target people who bought 60 days ago with a call to action to buy again. The time frame here of 60 days will largely depend on your buying cycles. A more appropriate time frame for your business could be less than 60 days or more. It would depend on how frequently people buy again from you. When sitting down to write your copy for these Facebook ads, take a moment to think about the target audience. How have they interacted with your brand already and what types of things would they benefit from hearing from you? Within our agency, we have a very growth driven approach to Facebook marketing. What does that mean, exactly? Well, we are focused almost entirely on one thing and one thing only with Facebook ads: making you more money. Will you get more traffic? Sure. Will you get clicks from your ads? Of course. However, at the end of the day, you want more sales from your Facebook ads. We get that. As a result of this approach to Facebook marketing, you will hear us talk a lot about your Facebook ads return on ad spend (the amount of revenue generated for every dollar spent in ad spend) and whether or not you are traffic ready. In this post, I’d like to talk about being traffic ready. What does it mean to be traffic ready for Facebook ads? Well, you have sold some products to a cold audience (verifying product to market fit) and are currently getting some sales and traffic every month. We also like to see some other marketing efforts in place. A lot of our clients are working with influencers and doing email marketing before coming to us to start Facebook marketing. You also should know who your target market is (characteristics and demographics of people who buy your products) and why they buy from your brand.